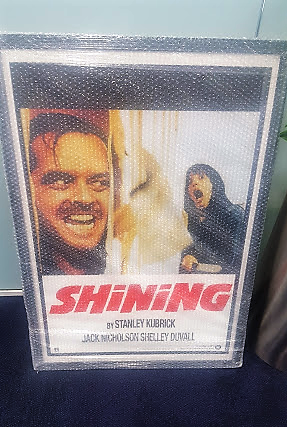 I am raising money for charity and am therefor selling a Original 1980 The Shining poster in a museum quality frame, i would like to auction it as i want to get as much money for my charity as possible, if you would like to make an offer then please contact me. Unfortunately, they are all $20 posters. It is difficult to figure out the frame either, because it could be located anywhere in the world, and shipping my be very expensive. If you are serious, please provide a large image and your location. Members here would prefer to see the poster out of the frame as well. Has the poster been mounted on any sort of backing board. This will also affect price because of preference of collectors and the difficulty of shipping a large poster that can't be folded or rolled. Best of luck with your charity. Hi Jay, it is the picture in my profile as i could not work out how to upload the image to the thread. sorry. I live in the US, north of Chicago, so this wouldn't work for me. Hopefully some of our UK members will chime in with some suggestions.